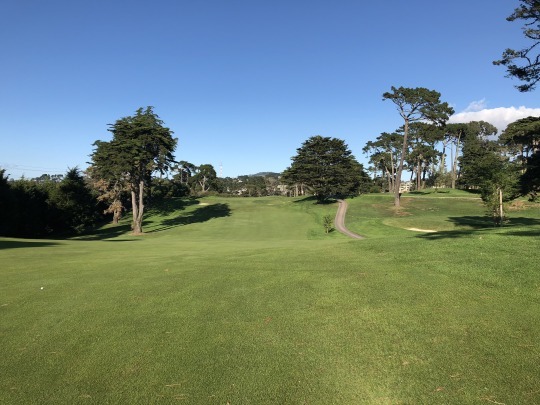 Monday’s round at Lake Merced Golf Club was the main reason for this most recent little trip to the Bay Area. It’s one I’ve been looking forward to for awhile. The NCGA has outings here every year and it is always their most popular event. In recent years, they’ve done two outings each year and they still sell out immediately after being posted in January. This finally worked out as the year to get in on one of these outings. 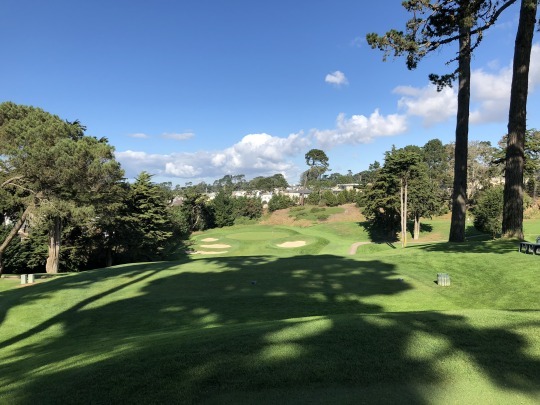 It’s kind of interesting it happened that way since I also got to play Cal Club this summer. 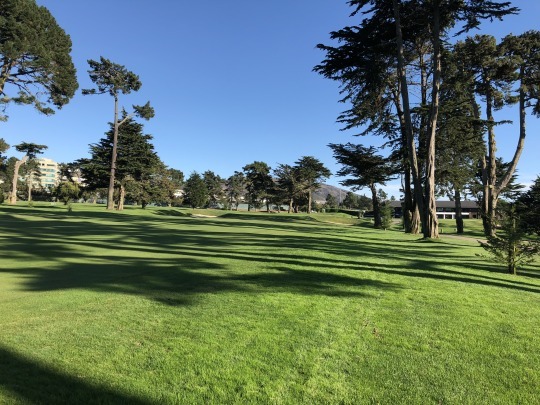 In my mind, these two courses are part of San Francisco’s “Big Four” clubs—Big Five if you want to count the public TPC Harding Park complex. 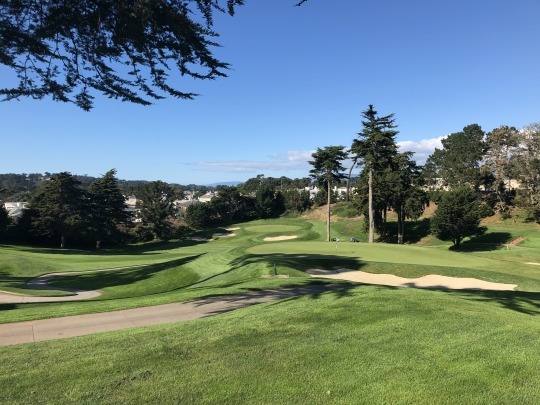 Otherwise, the city’s Big Four would consist of the private courses at California Golf Club of San Francisco, Lake Merced Golf Club, San Francisco Golf Club and Olympic Club. 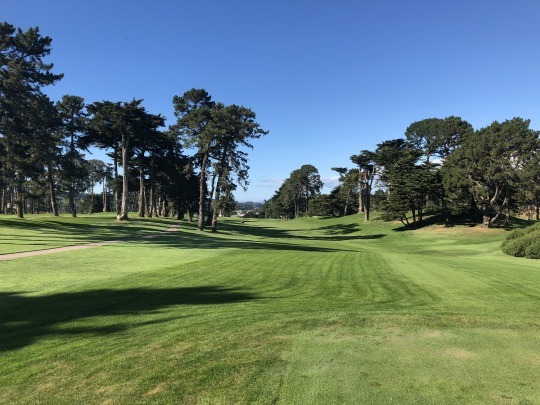 Cal Club is a bit more separated geographically, whereas the rest (including Harding Park) are all really close to one another. 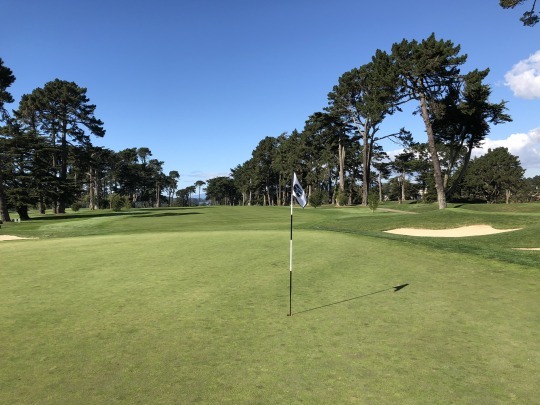 All of these clubs have a ton of history, rich course design pedigrees and high-end reputations. It’s an honor and a pleasure to have a chance to play any of them, and I hope someday I get to experience Olympic and/or SFGC. This day was all about Lake Merced, though. We arrived early and had plenty of time to enjoy the stunning course views and beautiful clubhouse before the shotgun start at 10:30. They had a nice continental breakfast set out and box lunches were also provided, along with NCGA hats for all the attendees. 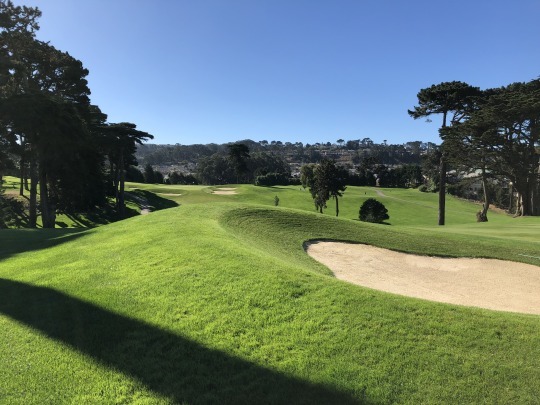 Lake Merced has kind of a complex design history. A lot of very famous architects have had their hands in what makes up the course you see today. 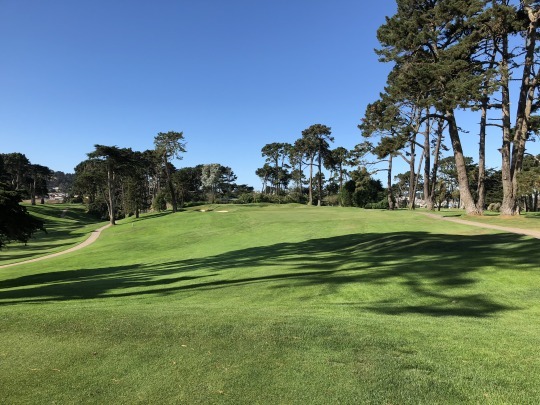 The club was founded back in 1922, with the original course designed by Willie Locke opening in 1923. 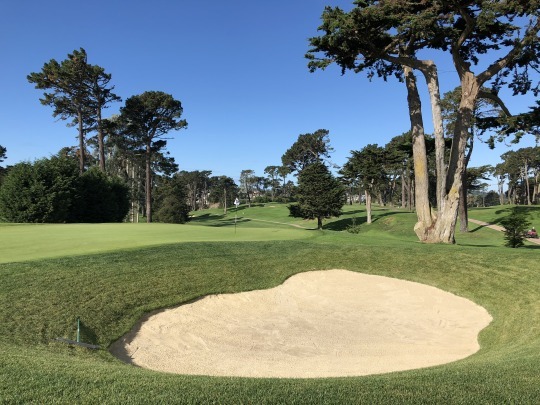 Alister MacKenzie came in a few years later to rework the bunkers, though any remnants of his work are hard to see on the course today. 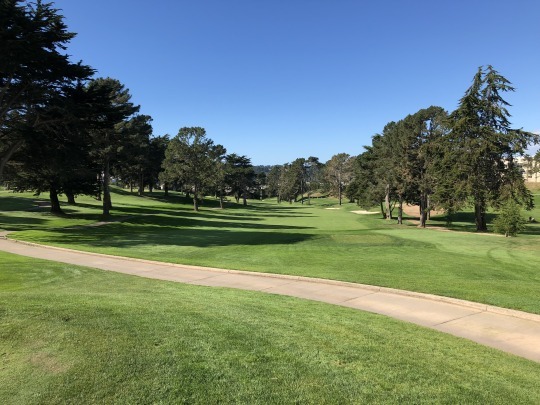 The course was dramatically renovated in the 1960s when the I-280 freeway was built. It runs right next to the course and essentially wiped out several of the original holes. Robert Muir Graves was brought in to reshape and reroute the course while adding in some new holes. 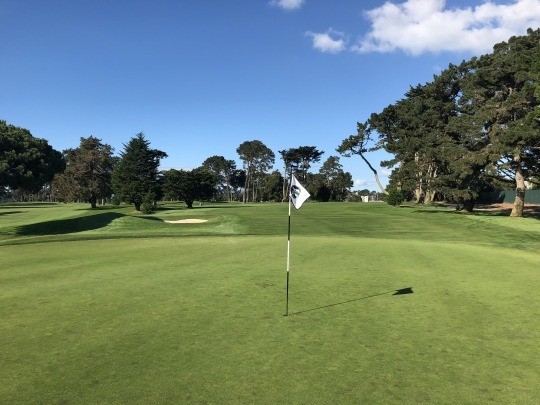 Agronomy problems in the 1990s forced another renovation, this time by Rees Jones. He revitalized the course with some more modern touches. Other projects have happened throughout the past 90+ years that have altered the course in various ways. 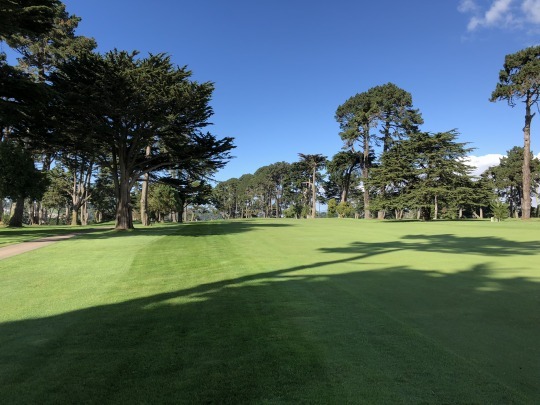 Despite all of that, Lake Merced retains a great layout that blends some old and new elements. 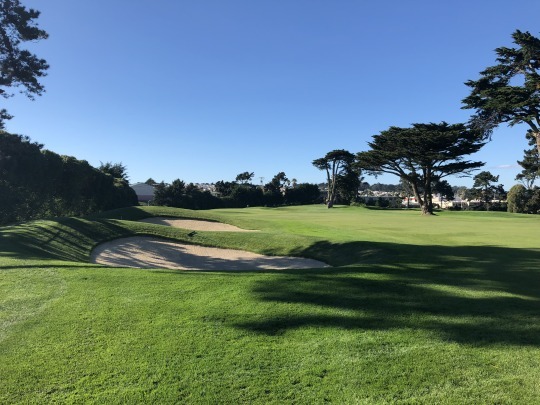 The San Francisco setting with hilly terrain and beautiful cypress/pine trees gives you a classic and historic Bay Area feel, while you can easily tell some modern touches have been added throughout the years. However this course came to be what it is today, it looks great and plays nicely. 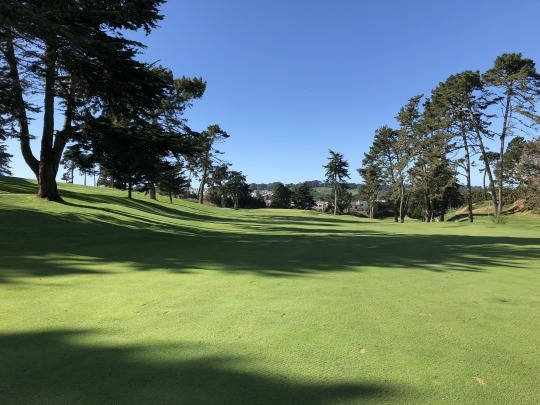 There aren’t too many flat lies on Lake Merced as it winds its way up and down the hills and around the thick rows of tall trees. 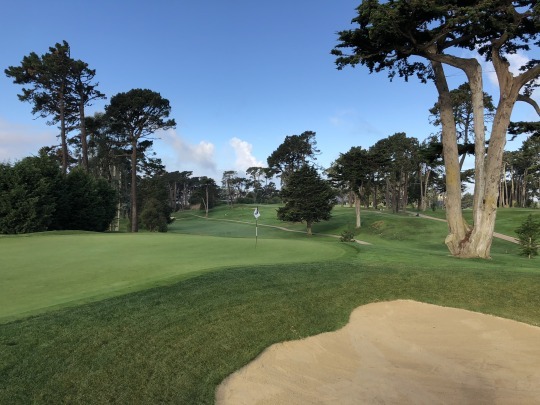 There are numerous doglegs in play and most of the greens are elevated. A lot of the holes have you going up and then down, or down and then up as you work your way from tees to greens. There are no water hazards on the course, and there are only a few OB areas along the outer edges of the property. 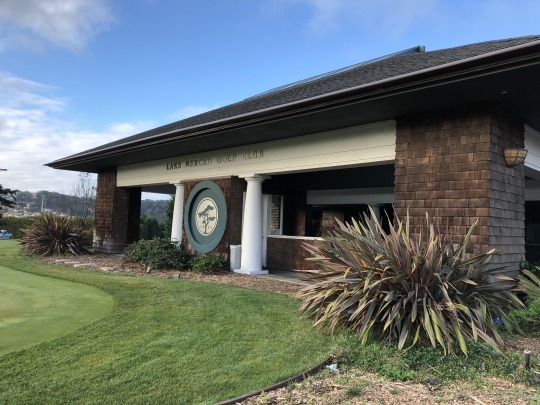 This will be the first year since 2013 when the LPGA will not have a tournament at Lake Merced. That’s too bad because I’d love to watch the pros play it on TV now that I have played it myself. 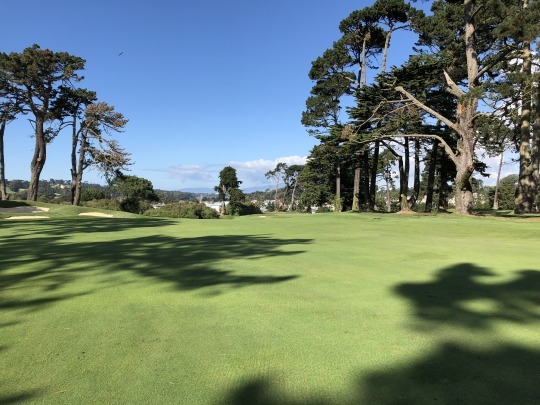 Lake Merced is a deceptively challenging course. 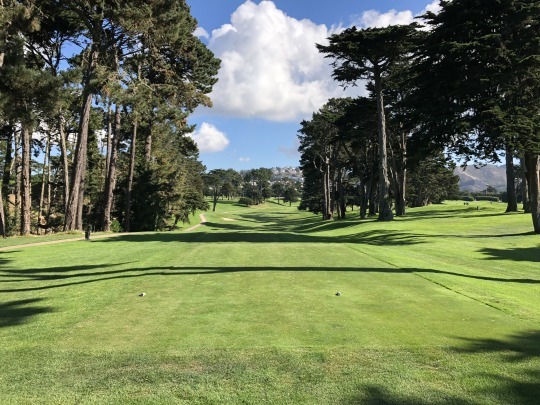 The doglegs, hills and trees will make you work for a good score because positioning off the tee is so vital. 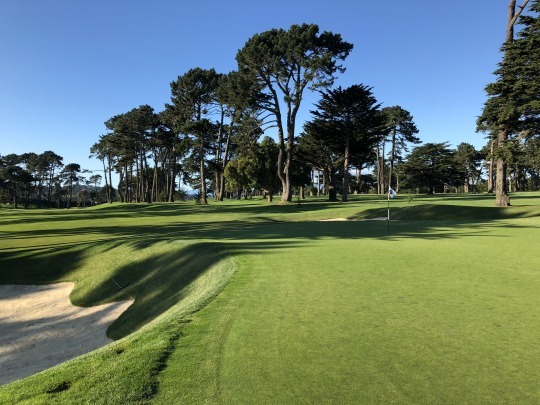 It’s definitely one of those courses you’d need to play several times before feeling truly comfortable hitting certain tee and approach shots. Conditions were great overall. 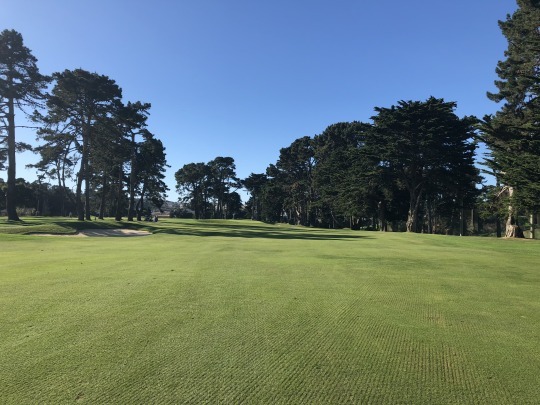 They had recently verticut the fairways, so they were slightly grooved. Still, it didn’t affect much. 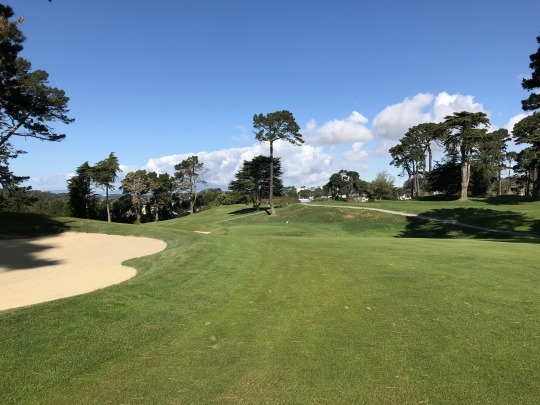 The fairways were kept firm and tight while the rough was super thick and sticky. Another renovation made at some point along the way was converting the greens from poa annua to bentgrass. They are designed to play fairly firm and roll at fast speeds. 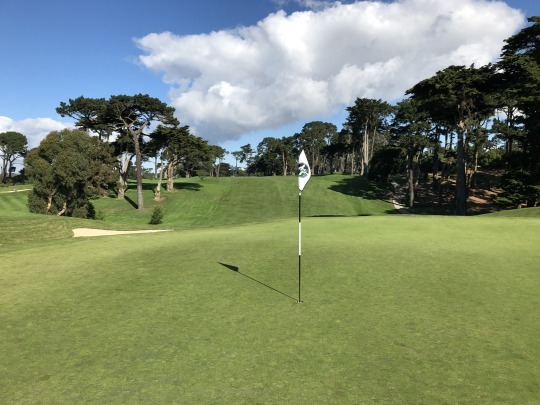 These greens were quick and the slopes were tough to read, so three-putts were always a concern, especially if putting downhill. The bunkers, as you might expect, were perfect. 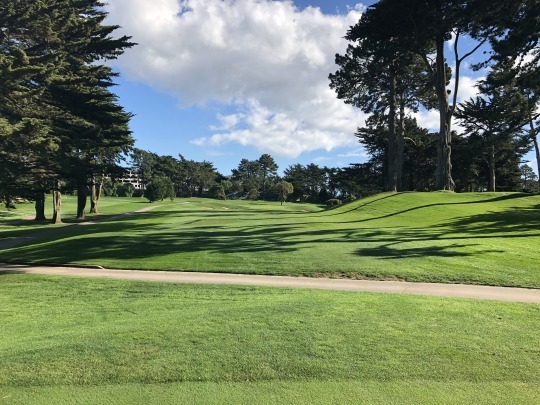 Lake Merced is one of those timeless courses where I won’t remember many different holes specifically, but I will remember the feeling of the course as a whole. I’m not sure what you would consider the “signature” hole here, but the entire place has such a great look and every hole presents a unique challenge. I would still rank Cal Club higher than Lake Merced. 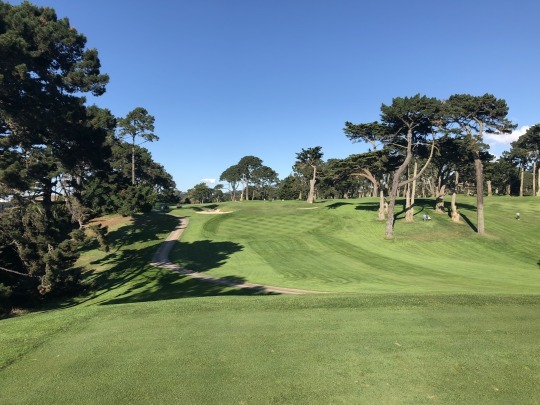 Both are similar in the respects that they are old courses that have been renovated multiple times, but there was just something more distinctive about Cal Club. I wouldn’t hesitate to recommend either course if you ever have a rare opportunity to play them.